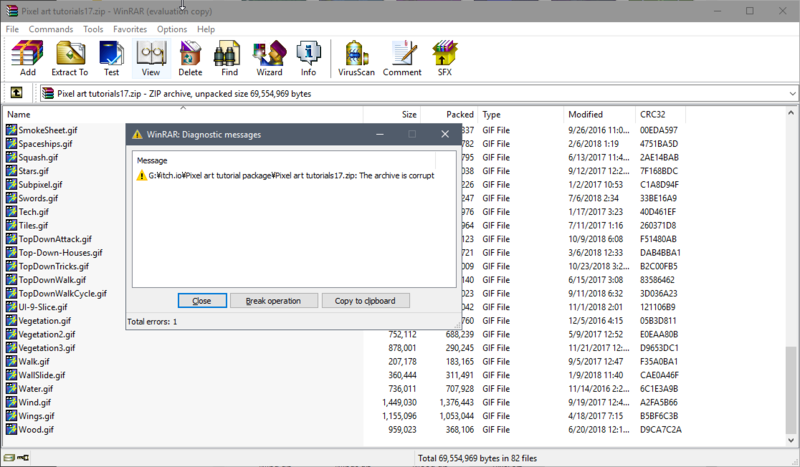 Pixel Art Tutorials 17 zip file is corrupted. I use Windows 10 and have been failing to download the update. It worked for me, just downloaded it. Maybe try redownloading, and using 7zip (free, here) to unzip it? Just downloaded it too and used another tool. Even the itch.io client can't install it saying it's corrupted. I tryed to download the zip file on my android smartphone and guess what,it worked fine regarding the files that you can't acces on pc.So here is a "quickfix". Cheers!